I'm happy to say, I've found "my sauce"! I sort of threw this recipe together based on a You Tube video I watched (and eventually made the recipe ...to be seen here soon) and two other recipes I found online. I didn't have all the ingredients for any one the recipes, so I made up my own combining these recipes and using what I had on hand. Many timesSome times when I experiment in the kitchen, I am not always overwhelmed in a positive way by the results. The marinara gods were with me, though, and this recipe has that special something something I've been looking for. What makes this sauce special is actually the meatballs. The Italian sausage flavor from the meatballs, perfume the sauce with a mild spice that takes the sauce to the next level. And if you think turkey meatballs are "boring", I assure you these are not. In fact, I really want to make this for my dad and not tell him the meatballs are turkey. He pretty much believes turkey is NOT substitutable for beef. But I'm pretty certain he'd like these. The meatballs are tender and the Italian sausage flavor comes through, but doesn't over power. It really is just right. At least for me, Hubby and our niece who helped us make the most recent batch. This recipe is most definitely a keeper. Note - If you are a vegetarian and don't plan to make the meatballs, I recommend following the sauce recipe and adding 1/4 to 1/2 teaspoon of cayenne pepper (depending on your spicy tolerance) to bring a little heat. Also note, I haven't tired this myself, but this is what I would do based on tasting the sauce before the meatballs go in. 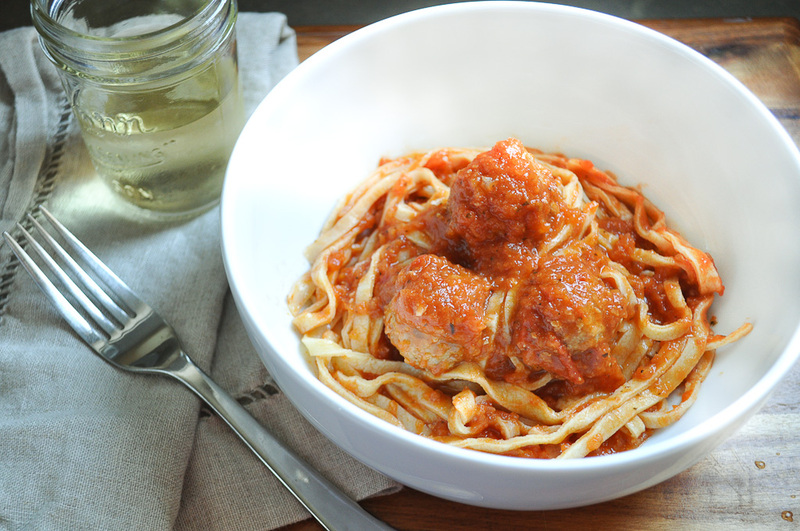 We've been enjoying the sauce and meatballs over fresh made pasta, though dried pasta would work well too. And it makes fabulous leftovers for a meatball sandwich! Heat dutch oven or large sauce pot on medium high heat and add olive oil. Add tomato slices in a single layer (slightly overlapping is okay) and season lightly with salt and fresh cracked pepper. Cook in oil for 3-4 minutes until the tomatoes start to get tender. Flip tomatoes over and add garlic and cook on medium high for 2 more minutes. Stir the tomatoes and garlic. You should smell garlic and the tomatoes should start to break down. Add minced onions and cook until tender about 3-4 minutes. Add remaining ingredients and stir until combined. Bring to a boil and reduce heat to low and simmer the sauce. Cover and cook for 20 minutes. 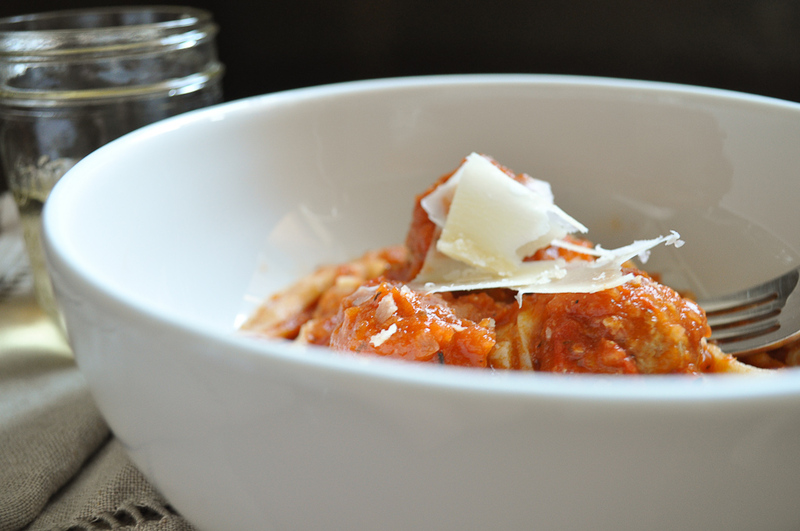 While sauce is cooking, make the meatballs (see meatball recipe below). When the sauce has cooked for 20 minutes give it a taste. Does it need a little more salt? Sugar? Pepper? Add additional seasoning as needed (I've made it twice and added just a touch extra salt at this point). Use an immersion blender to blend in sauce until smooth (there will still be some chunks, that's okay). If you don't have an immersion blender, you can puree the sauce in batches in a stand blender and return sauce to the pot. Add meatballs making sure each meatball is covered in sauce. With heat on low, cover and cook 30 more minutes, until meatballs are cooked through but still tender, stirring sauce and meatballs every 7 to 10 minutes. Remove cover and continue cooking on low for 15 minutes. Mix all ingredients in a medium bowl until thoroughly combined and Italian sausage is even distributed. Using a medium cookie scoop (about golf ball size) scoop out meatballs onto a baking sheet lined with foil. Once all the meatballs are scooped, use your hands to roll into rounded balls. Once all the meatballs are rolled, gently place each meatball in the sauce. 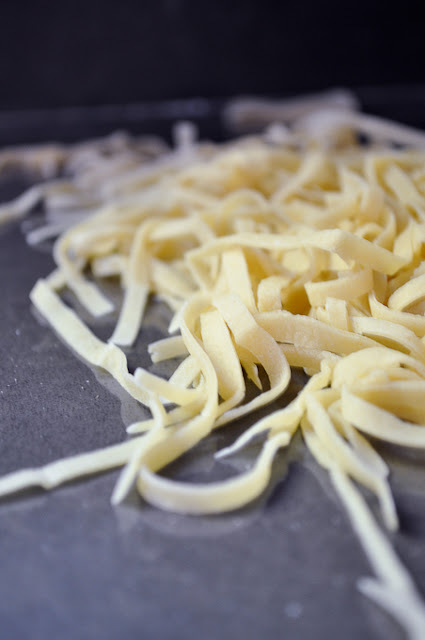 Serve over 1 pound of your favorite store bought or home made pasta. Garnish with fresh grated parmesan cheese. I think that a good tomato sauce should have some meat in it, for that incredible flavor. This sounds great, especially if you have a hubby to make the pasta! What a bonus! I myself have been awaiting good things from the marinara gods, but to no avail so far. But that is interesting what you said about how the meatballs took the sauce to the next level, I'm going to have experiment with that. I would go with the vegetarian variation--but my meat loving guys would love me even more if I made meatballs!! This looks delicious, I'll try it soon. Wish I had someone to make the fresh pasta!